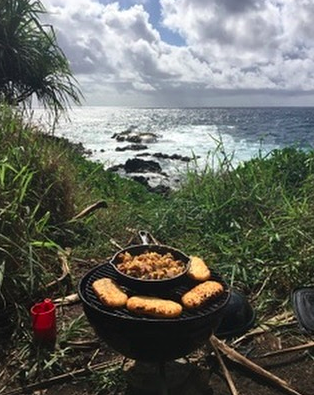 Camping doesn’t get much better than on Maui. If you love nature, there is something for everyone—the temperatures are comfortable, the views are spectacular, and there are epic adventures around every corner. Where to begin? First of all, plan to spend at least a full week on Maui. There is so much to see that you may find there is not enough time to try and visit several islands if you only have a week or less. The trip to Hana, for example, is all about the journey and less about the destination. While Hana is an adorable small town, it is the journey there that is truly incredible offering the opportunity to see numerous waterfalls and fabulous beaches. A trip like this deserves the right amount of time to be spent there in order to soak up the sights. The real Maui experience lies in both the big and little things—like standing on Haleakala (part of one of the 59 U.S. National Parks that our website is named in tribute to!) at 10,000 feet and bearing witness to the expansive views, to exploring waterfalls, swimming in the ocean, trekking through green lush forests, and watching gorgeous sunrises and sunsets. What we love about camping here at Maui Camping Co is that it allows us the chance to slow down and really connect with nature in a way that is often lost in our modern day society. Camping affords one the chance to stop and recognize the little, more subtle things that make Maui a place of magic. The magic lies in standing on the north shore of the island and breathing in the cleanest air in the world that has not touched land for 2,500 miles, watching the turtles slowly coming onto shore in the evening, listening to the sound of the wind through the bamboo forest, taking a deep breath and relishing in the smell of the plumeria and eucalyptus trees that makes the air so fragrant, and tasting fresh fruit grown all over the island. These things are all part of the Maui experience and can be enjoyed while visiting here. When it comes to camping, Maui is a chose your own adventure kinda place. For sleeping right up on the beach with generally drier conditions, you can go to West Maui’s Papalaua or Olowalu campgrounds. If you want to do the road to Hana and take your time, Wai’anapanapa and Kipahulu are both amazing places to set up camp. If you want a truly amazing adventure, go backpacking up in Haleakala crater and experience spectacular star gazing that is truly out of this world. You dream the adventure, we can make it happen. Check out Maui Camping Company for more information about how we can make your trip to Maui a different way to experience the island that you'll never forget. Special thanks to my friends here at Hashtag 59 for letting us share some of our favorite places to see and experience when hanging out on Maui. We hope to see you soon. Aloha! Have you been to Maui? What is one of your favorite memories?